In 2017, Gale Banks presented the world with a solution to a problem in the most elegant way possible. In the Great Intake Elbow Shootout, Gale examined all available intake elbows for the 2013+ Ram 6.7L Cummins. From the factory, the engine is forced to breathe through a very restrictive intake. As a result, several manufacturers jumped at the chance to sell an intake elbow that would reduce restrictions for tuned, high-horsepower race engines like those who’ll be competing in the Ultimate Callout Challenge (May 3-5) at Lucas Oil Raceway in Brownsburg, Indiana. In the video, Gale uses his engineering prowess to analyze all of the competitors’ intakes before revealing his own creation. Some were cast aluminum while others were bent steel tubing. But one thing they all shared was their inability to flow properly because they had to account for a big obstruction: the No. 1 injection line. The routing of this factory fuel line forced these intake manufacturers to put a big dent in their design, thereby disrupting airflow. Gale wasn’t going to let a little fuel line get in the way of perfect airflow so he did what all good engineers do, he designed his own. His new injection line, made by a top-tier OE supplier, hopped up and over the intake in order to allow unobstructed flow. After revealing his design, the fact that it outflows stock by 576 CFM (4″ inlet), and its competitive price, the Monster-Ram immediately took over as the preferred air intake for Ram owners who race their tuned trucks. 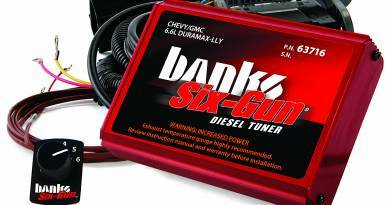 Available with 3.5″ or 4″ CNC machined inlet, Banks offers the intake coated in the company’s signature blood red powder coat or raw aluminum for later customization. When he debuted it, Gale had no idea the Monster-Ram would quickly become the most customized part he’d ever made. Every day, racers from all over the country lift their hoods to reveal a touch of their own personality. If you’ve customized a Banks product, be sure to tag @bankspower on Instagram. Here are a few of our favorite customizations. 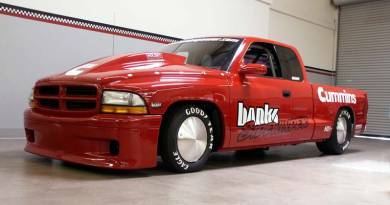 ← Banks-powered first-gen Dodge Ram finds new life.